Sanjoy Roy: "You need to be passionate about arts to be able to work in it"
The fourth edition of India by the Nile, a multidisciplinary arts festival, takes place between 23 April and 7 May, bringing a variety of Indian offerings to six cities: Cairo, Alexandria, Ismailia, Port Said, Sharm Al-Sheikh and Beni Sweif. The festival invites the audience to enjoy the many layers of India’s culture, this year presenting Odissi classical dance, an Indian Ocean fusion band as well as Indian cuisine and wellbeing exercises among many other elements. But to many Egyptian followers of India’s films and TV series, the glimpse of Bollywood is the festival’s core attraction. Following its annual tradition, on 22 April, the Indian artists marked their arrival to Egypt with a Bollywood-style dance flash mob that took place at Cairo International Airport. The event was just a small teaser for the musical Bollywood Love Story, which was staged at the Cairo Opera House on 26-29 April and at the Alexandria Opera House on 3-4 May. 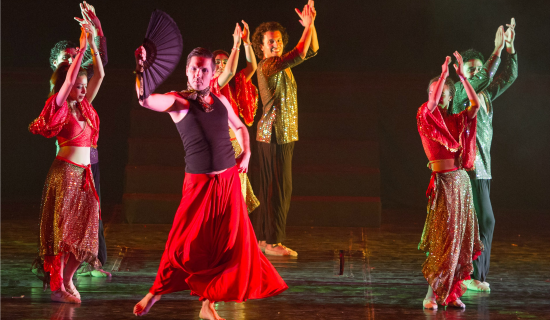 Produced and directed by Teamwork Arts (read the interview with the company’s head Sanjoy Roy here), the show is choreographed by the India-based French dancer Gilles Chuyen. It depicts two protagonists in love whose happiness is obstructed by a villain. As to be expected of a typical Bollywood-style fairy tale, love wins in the end, but on the way to the happy ending the spectator is offered a highly dynamic treat with rich costumes, sparkling colours and well-known songs from the Bollywood’s repertoire. “We all know about the Bollywood film industry based in Mumbai (Bombay). As it developed over the past century, it also became a style of acting and dancing. However, the Teamwork Arts is based in Delhi. With musicals such as Love Story, we bring a sample of the Bollywood’s spirit to the stage. In those productions, we do not work with the film stars but rather we incorporate the well-known songs, dance and visuals into a storyline created by Sanjoy Roy himself,” choreographer Gilles Chuyen explains. Chuyen adds that Love Story too was performed in Egypt in 2014, during the second edition of India by the Nile. This year the storyline remains the same, but many of the songs, sets and costumes, as well as the cast including the narrator are new. Since 2008, the show has toured dozens of countries. Chuyen confirms that it is always received with great acclaim and enthusiasm regardless of the audience’s background. The same is true of Teamwork Arts’ newer production, the Bollywood Extravaganza musical. Chuyen explains that “those shows allow people to dream again and get transformed, even if this takes place for a short while. You would notice how at the beginning of the show the audience is very calm and as the performance progresses, they stand up and even join in the dance. Shows like the Bollywood Love Story talk to their emotions and have a power to open up human expression. And the reason is very simple: in Bollywood, everything is bigger and louder than life and even if many of its elements might not make sense, it is exactly the kind of reverie that attracts the audience." 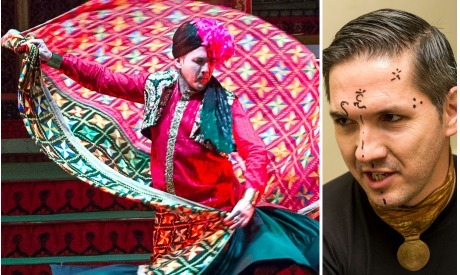 The more Chuyen talks of the Bollywood show, the more his eyes begin to shine with enthusiasm – for, to this French choreographer, these shows represent a part of his much more complex personality. The Bollywood-style dance is only a small fraction of his passion for movement as a liberating human expression. In our conversation, he soon reveals that dance represents one of the fundamental components of his wide creative, academic and spiritual journey. I discover that Chuyen’s life-story intertwines profound academia with a passion for life. Born in France, Gilles Chuyen has many kinds of blood. With a grandfather from Vietnam – hence name Chuyen – he is “quarter French, quarter German, quarter Spanish and quarter Vietnamese”. He swiftly points to his family’s cultural background as the reason behind his fondness for Asia’s culture and history. Though he practises many aspects of creativity – painting and writing as well as dance – Chuyen stresses that he has always been particularly interested in dance. Though the dance played an important role in the young man’s life – he did ballet for more than ten years, explored other genres, touching on modern jazz, contemporary, etc – he cultivated this passion alongside his regular studies. For several years, he continued to divide his life between dance and the Institute of Political Studies at the Aix-Marseille III University. It was the latter faculty, he believed, that could help him understand the world. And though the academia provided knowledge, to Chuyen it also opened an even wider territory of questions about life and spirituality. As Chuyen explains, those questions directed him to many readings and “once you explore life you will automatically find yourself in the literature of India. It is a country that gives you a wealth of knowledge and truth. I found that in India, there are many perspectives on life, each fascinating and deeply enriching.” Chuyen completed his university and MA in political science in France and received a scholarship to proceed with a PhD in India, where he wanted to do a field work. Chuyen compares those “hidden messages” to the mudrahs (hand gestures) and abhinayas (face expressions) practiced in India’s classical dance forms. Both components have a charismatic appearance yet at the same time they are profound encodings of meanings and centuries of cultural philosophy. And it is in this context that Chuyen expresses how lucky he feels to have been able to develop knowledge of India first from an academic and intellectual point of view. Chuyen further explains the concept pointing to a more obvious example in the energy created between the performers and the audience of the Bollywood show. It is this circulation of energy that transforms the whole experience, making it a journey. “Understanding this truth was revolutionary to me,” he stresses. Today, as he looks back on over 20 years he has spent in India, Chuyen embraces many testimonies of his personal growth and transformation, on the artistic and spiritual levels. Apart from working in the Bollywood-dance for 14 years now, he also touches on many undertones of creative expression. He gives workshops, and works with dance and theatre troupes. With In Step, Chuyen presented several shows in which he explores and puts in practice the creative and emotional triggers, abstract notions or emotions, he has collected over the years. On the technical level, Chuyen’s works fuse contemporary dance techniques with Indian classical dance elements, with the latter being obvious in the work of the hands. This creative fusion is apparent in Prakriti (Nature, 2009), for instance, where the dancers, as the title indicates, walk the viewers through the elements of Mother Nature. On the stage we find a small group of the performers who depict the images and behaviours of wild flora and fauna. The soundtrack underlines the natural environment. At a certain moment, each dancer depicts a tree which transforms into a larger than life insect. 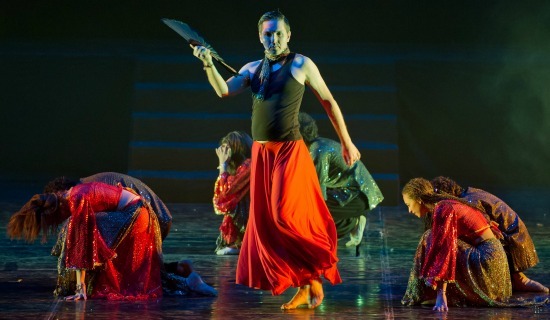 In 2011, Chuyen also choreographed Bija which is the story of a flower and a butterfly. This show tackled topics of female and male energies. But there is also another layer in Chuyen’s creative mind: colour. Whether in the process of work, choreography or while he paints, colour is not limited to a shade or a tone perceived by the eyes. Chuyen finds in a given colour a particular energy and sees it in music. “I remember, as a small child I would imagine that even words have distinctive colours and shades. Equally, the music carries different colours,” he clarifies, explaining how his creative process is embedded in this belief. “In all my work with Teamwork Arts, the director Sanjoy Roy works on a storyline and the mise-en-scène. Then we choose music. As I listen to the final selection, I close my eyes and feel the colours. This directs me to movement, as well as the concrete colours that should characterise each character.” He adds that he also makes many decisions regarding the costumes and their colours. In fact, the very first performance that the In Step company staged was titled Colors (2007). “For two or three months we worked on different vibrations of the colours: red, purple, orange, yellow, blue, etc. Each of them was represented by one dancer. While imagining those colours, the dancers captured each colour’s unique energies which in return triggered their emotions. Then they translated this charge into movement.” Following individual experimentation with a given colour, Chuyen would join the dancers in pairs. He explains that some of those colours fit together perfectly, while others did not match. He also believes that the whole experience allowed the dancers to discover themselves as human beings and touch on many elements of their personalities, breaking their emotional blocks and as such becoming a healing experience. One of Chuyen’s recent performances, titled The Color White, is a solo contemporary dance show which he created in collaboration with an India-based Iranian musician, Fakhroddin Ghaffari. As Chuyen dresses in a white gown and whirls, reminding us of the Mevlevi tradition, he finds in white purification, innocence as well as other concepts such as a white clown. Last March, The Color White was performed within the first round of Expressions – International Contemporary Dance Festival, a three-day annual event launched by the Teamwork Arts which showcases contemporary dance from India and the West. As he dances, exploring concepts and colours, Chuyen continues to ask questions. One such poignant inquiry came in the course of a performance entitled What Is Dance, a contemporary dance show he choreographed in 2014 with In Step. The performance is linked to a book of the same title which Chuyen is in process of writing. The performance represents his reflections on the creative journey and his attempt to answer questions related to dance as one of the fundamental forms of expression. On Facebook, he accompanies the performance’s inquisitive title with a few simple words aimed at providing a concise definition: “form, rhythm, concept, color, emotion, memory and energy”.